Leadership Pub Talk: Welcome Oregon Baseball To Our Team Of Subscribers! 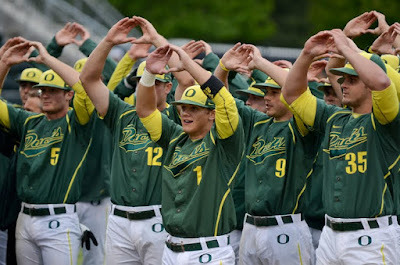 Welcome Oregon Baseball To Our Team Of Subscribers! In nine seasons at the University of Oregon, George Horton has resurrected a dormant Ducks’ baseball program and built it into a national power. During his tenure with the Ducks, Horton carries a 320-220-1 record (.592) and has led Oregon to the postseason five times, including four of the last six seasons. Horton, hired in September 2007, is the Ducks’ 12th baseball coach in school history and its first since the program was discontinued following the 1981 season. Overall, Horton has a 1,036-485-2 record (.681) as a head coach and a record of 810-432-2 (.652) in 20 seasons as a Division I head coach. Under Horton, Oregon made its first modern-era NCAA appearance in just its second season of existence, playing in the NCAA Regionals in 2010. The Ducks topped that effort in 2012, advancing to their first Super Regional and finishing just one win shy of advancing to the College World Series. The successful season by Oregon landed Horton the 2012 Field Turf NCAA Division I Coach of the Year award. We are proud and honored to have Coach Horton and the Oregon program on our team of subscribers! Our subscribers know that great leaders never stop learning and they never stop reading. They realize that for less than most people's monthly cable bill they can receive a year's worth of information that will make them better leaders, coaches and administrators. We would love to have you on the team!